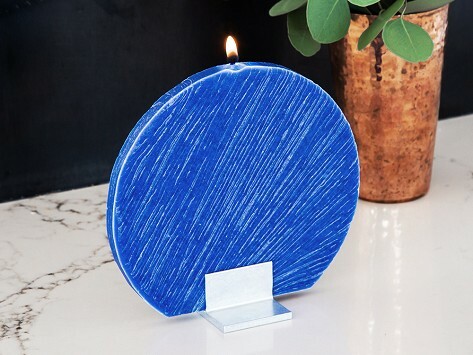 This round, hand-poured candle is a tabletop-worthy addition, even when it’s not lit. Made from clean-burning, low-soot palm wax, the flat candle stays in shape as it burns. Each candle is carefully handcrafted in Indiana (down to the stand) and is inspired by traditional European artistry. Dimensions: Candle: 6.5" x 6" x 0.38"; Holder: 2.38" x 1.75" x 1.13"
Weight: Candle: 0.38 lb. ; Holder: 0.09 lb. I love this candle! I will be purchasing more. Very unique for tabletop, as an accessory or a great gift giving idea. Definitely a standout!